Cheteshwar Pujara and Murali Vijay both scored unbeaten hundreds as India took control of the second Test against Australia in Hyderabad. Pujara finished on 162 not out and opener Vijay added a more watchful 129 as the hosts closed the second day on 311-1 - a lead of 74. Australia's only success of the day came when Peter Siddle had Virender Sehwag caught behind for just six runs. Cheteshwar Pujara has now scored four centuries in 11 Test matches. Of those tons, his lowest score is 135. His other scores are 206 not out, 162 no and 159. 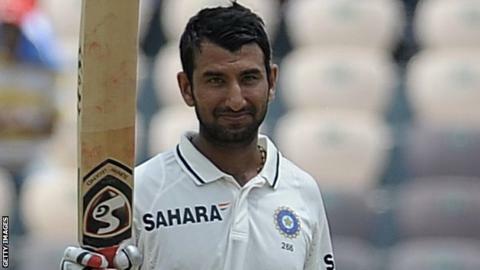 However, Pujara and Vijay then took over with a chanceless stand of 294. It was a chastening day for the Australians, who looked short on ideas and inspiration in the field. Spinner Xavier Doherty got some slight turn without any real success, while seamers James Pattinson, Moises Henrique and Siddle posed little threat at the other end. Sehwag was dismissed when he fended a short delivery to wicketkeeper Matthew Wade in the fifth over but Pujara and Vijay knuckled down and slowly took control. It was the second century of Vijay's career, while Pujara continued the fine form which saw him score an unbeaten double century and a ton in consecutive Tests against England before Christmas. The closest Australia came to a breakthrough was a run-out appeal in which replays showed Pujara was comfortably home. Both players were cautious in the morning session before they increased their scoring rate after lunch. Pujara hit Pattinson for three boundaries in an over while Vijay smashed Doherty for six. All-rounder Glenn Maxwell, who was purchased for $1m (£637,000) in the recent Indian Premier League auction, also came in for punishment as he conceded 55 runs in 10 wicketless overs. Pujara was particularly fluent as he went from 100 to 152 in just 42 deliveries - bringing up the milestone by hooking Siddle for six. With the Australian attack running out of ideas, the ruthless duo plundered 151 runs in the final session to leave India, who lead the four match series 1-0, firmly on top. We are using archive pictures for this series because several photo agencies, including Getty Images, have been barred from the ground following a dispute with the Board of Control for Cricket in India, while other agencies have withdrawn their photographers in protest.